The anterior cruciate ligament runs obliquely within the lateral aspect of the intercondylar notch, attaching to the inner aspect of the lateral femoral condyle proximally and to the anterior aspect of the intercondylar eminence of the tibia distally. 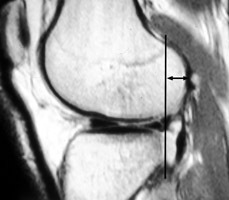 An anterior cruciate ligament-deficient knee allows the tibia to undergo subluxation anteriorly relative to the femur. This is the MR equivalent of the anterior drawer sign.